Georgia Mae Henshaw1,2,3,4 [Georgie May Henshaw5,6,7,8,9]. Grace Clifford Rose, born Jul 22 1918; died Jan 3 2013; married Denton Truett Atchison, Jun 30 1937, Haskell, Texas (child: Shirley Atchison, married Jackie Reed). Opal Rose; died before Jan 3 2013; married -- Hood. Babe Rose; died before Jan 3 2013; married -- Teague. Frances Rose; died before Jan 3 2013; married -- Lytle. Rose, Clifford C., head-of-household, age 28, born in Texas; parents born in Tennessee; rented home; farmer. Rose, Georgia M., wife, age 22, born in Texas; father born in Alabama; mother born in Texas. 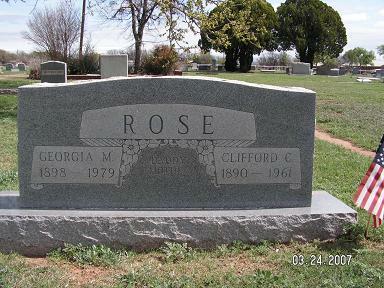 Rose, Clifford G., daughter, female, age [..unclear..], born in Texas; parents born in Texas. [..unclear] Robt E., hired hand, age 21, born in Texas; parents' birthplaces unknown; single; farm hand. Rose, Cliford C., head-of-household, age 38, born in Texas; parents born in Tennessee; first married at age 25; rented home; no radio in home; occupation: farmer, general farming; not a veteran. Rose, Georgia M., wife, age 32, born in Texas; father born in Alabama; mother born in Texas; first married at age 19. Rose, C. Grace, daughter, age 11, born in Texas; parents born in Texas; attended school. Rose, Chal M, daughter, age 9, born in Texas; parents born in Texas; attended school. Rose, Callie L, daughter, age 7, born in Texas; parents born in Texas; attended school. Rose, Shirley, daughter, age 5, born in Texas; parents born in Texas. Rose, Joelene J., daughter, age 10 months, born in Texas; parents born in Texas. Henshaw, R. Callie, mother-in-law, age 64, born in Texas; father born in Germany; mother born in Alabama; widow; first married at age 15. Funeral services for Mrs. Georgia Rose Moore, 81, of Haskell were held at 2 p.m. March 26, in Central Baptist Church with Rev. James Edge, Baptist minister of Sulphur Springs, and Rev. Cleburn Moore, Baptist minister of Odessa officiating. Burial was under the direction of Holden-McCauley Funeral Home. Mrs. Moore died March 24 at 10:30 p.m. at her residence. Born January 26, 1898 in Bell County, she had been a resident of Haskell since 1905. She married C.C. Rose, January 28, 1917 in Haskell. He preceeded her in death June 5, 1961. She married Richard I. Moore January 9, 1964 in Haskell. She was a member of the Central Baptist Church. Survivors include her husband, Richard I. Moore of Haskell; five daughters, Mrs. Grace Atchison of Haskell; Mrs. Opal Scharf and Mrs. Joy Wolfenberger, both of Farmers' Branch; Mrs. Babe Teague of Abilene and Mrs. Frances Lytle of Amarillo; one step-daughter, Mrs. Talma Spangler of Haskell; two step-sons, Jack and Cleburn Moore of Odessa; two sisters, Mrs. Bessie Piland of Haskell and Mrs. Callie Scheets of Amarillo; 8 grandchildren; 12 great-grandchildren; 6 step-grandchildren; 12 step-great-grandchildren; and 4 step-great-great-grandchildren. Pallbearers were Elme Phillips, Jr., M.C. Piland, J.C. Halliburton, Truett Piland, Gene Rose and Bud Derr. Obituary of Willie (Henshaw) Rose. Obituary of Ida Jane (Henshaw) Ford. from a scrapbook kept by Georgia Mae Rose Moore, supplied by daughter Grace Atchison. Contribution from Colleen (Scott) Young (). George Washington Henshaw family bible. 1900 census, Justice Precinct 5, Bell County, Texas; roll T623-1610, ED 26, page 8A, line #8, dwelling #116, family #116. 1910 census, Haskell, Haskell County, Texas; roll T624-1562, ED 108, page 12A-B, line #46, dwelling #165, family #165. Haskell County, Texas, Births - 1928; USGenWeb Archives. 1920 census, Precinct 3, Haskell County, Texas; roll T625-1816, ED 133, page 4B, line #99, dwelling #62, family #78. 1930 census, Precinct 1, Haskell County, Texas; roll T626-2354, ED 3, page 11A, line #19, dwelling #191, family #213. Texas Death Index, 1903-2000; http://www.ancestry.com.